A few dollars and a little elbow grease can go a LONG way! I’m sure you’re already well aware of how much I love a good revamp, re-do, upcycle, makeover, etc. Not only is it a fun way to get creative, but it’s good for the environment to improve the things you already own (or somebody else has owned,) rather than buying something new. But you don’t have to sacrifice style just because you’re reusing something! I thought I’d put together a little roundup today of some of my favorite thrift store transformations, both from my blog and blogs around the web. I hope that these 18 projects will inspire you, and show that with a little elbow grease, frugal finds can become fabulous treasures! We transformed an old, outdated lamp into this fun and whimsical serving tray. I love the unique vintage look of this serving tray, but it’s as useful as it is cute! Using a couple of elevated serving trays like this makes for a more visually interesting buffet, and can help the table feel less cluttered if you’re serving a lot of different foods. This tray would make a great addition to any reception or shower spread! Large distressed candlesticks can add farmhouse chic to any table, but you don’t have to pay a premium for them. We made a set of our own distressed candlesticks using small flower vases we found at the thrift store! A large thrift store sweater can be turned into a bed for your furry friend in an afternoon. These sweater pet beds are a great option if your pet tends to be hard on beds (as in, they tend to destroy them on a regular basis.) Stock up on thrifted sweaters and you’ll be able to make a new one whenever you need to. 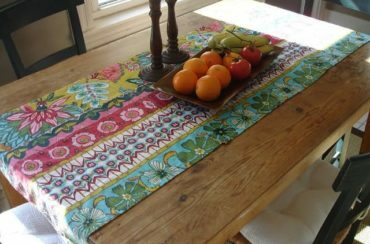 I found a cute vintage tablecloth during a thrift store outing several years ago, but didn’t know what to do with it. Then I came across a cute DIY window valance online, and knew that’s what I wanted to use my tablecloth for! This project took me all of 15 minutes, and I didn’t have to drill or sew a thing. Doesn’t get easier than that! Inexpensive laminate furniture can be found in abundance at thrift stores, but sometimes they’re not particularly nice to look at. Luckily, giving outdated laminate furniture a makeover is surprisingly easy! With a couple of coats of paint and some elbow grease, you can turn an outdated eyesore into a custom piece that adds tons of character to your home. Got a pile of old t-shirts waiting to be donated? You can use those shirts to make reusable tote bags! Take them with you when you go grocery shopping rather than taking home plastic bags. This is a great idea to hang on to for your outdoor party or backyard barbecue. A few simple tweaks can turn an old charcoal grill into a perfect cooler for drinks! Leave the lid of the grill open so your guests can help themselves. A simple glass vase gets a trendy makeover. The only supplies you’ll need for this one are some rope and a hot glue gun! A boardroom-ready pencil skirt without breaking the bank? No kidding! Autumn will show you how to make a pretty and professional pencil skirt using an old pair of men’s slacks. Changing out your lampshade is an easy way to update the look of any room or area, but you don’t have a buy a whole new shade. Check out how you can use patterned leggings from the thrift store to update your old, tired lampshade into something new and stylish. This adorable play kitchen used to be an old TV stand! Not only is it cuter than a standard plastic play kitchen, I’m sure it’s twice as sturdy, too! I like to keep a couple of folding chairs in the closet or garage for hosting bigger groups. I’ve found several inexpensive folding chairs over the years at thrift stores, but they are not very cute so I only take them out when I absolutely have to. But following these instructions, I can totally revamp the look of my folding chairs and make them look new and modern. I’m putting this project on my to-do list! An upholstered bench at the foot of your bed can be a stylish and useful addition to your bedroom. You can make your own for cheap by starting with a thrifted piano bench as your base! Clever, right? This octagonal serving tray goes from awkward to trendy. If someone told me this serving tray came from West Elm or Anthropologie, I would totally believe it! These old chairs found a new life as stands for food and water bowls for big dogs. The dogs seem to approve, and I’m sure it helps keep the floor underneath much cleaner! Sunburst mirrors are a big trend in home decor right now, and it’s surprisingly easy to make your own. Start with a round mirror from a thrift or secondhand store, and grab your glue gun and popsicle sticks. The result is seriously impressive! Spray paint covers a multitude of sins. For instance, a couple of coats of spray paint can turn a pile of mismatched picture frames into a unique collection fit for a gallery wall. 18. Armchair Makeover… Using Paint! The link for painting furniture? I agree with Stacey – do you have a link to to the toilet paper holder with the rope? It’s lovely! Is there a link for the toliet paper holder? It looks like it might be made from a can and some rope, very diy! Yes, I like it too! Jillee we need a link! This is a fabulous list of thrift inspired transformations!!! Love!!! some very cool ideas. thanks for sharing.